North Korean leader Kim Jong Un left his hotel in central Singapore on Monday night for an impromptu tour of the city. He is reportedly accompanied by his sister Kim Yo Jong, first vice department director of the Central Committee of the Workers’ Party of Korea (WPK), vice-chairman of the WPK Central Committee Ri Su Yong, and others. Local media the Straits Times earlier in the day reported that Kim would take a small city tour of Singapore. The North Korean leader was expected to stop by Marina Bay Sands’ SkyPark, the Esplanade Bridge among other locations, the newspaper added. Reports of the planned visit to the Marina Bay Sands Hotel were confirmed when media captured Kim surrounded by dozens of bodyguards entering the hotel around 2200 local time. NK News reporters on scene then spotted Kim and his entourage at Esplanade Park just to the west at 2220, around a one km walk from the hotel. 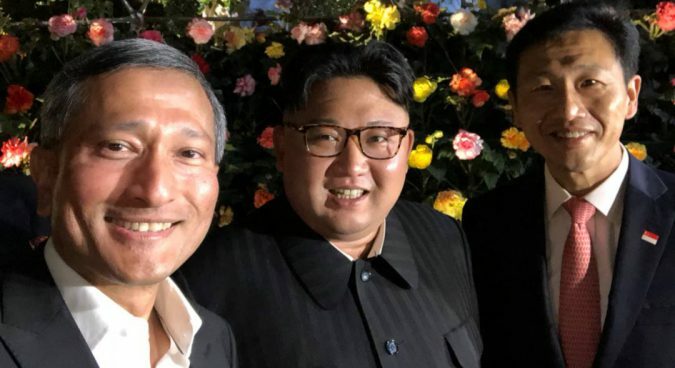 Outlets gathered near the St. Regis could not see the North Korean leader until around 2100 local time, following his met with Singaporean Prime Minister Lee Hsien Loong. The DPRK leader is set finally meet with U.S. President Donald Trump at the Capella Hotel on Sentosa Island at 0900 local time on Tuesday. Geoffrey See, a Singaporean who runs the Choson Exchange NGO, told NK News that the site had a symbolic meaning. U.S. Secretary of State Mike Pompeo earlier in the day told the press that the U.S. would be willing to help open North Korea up to foreign investment should the country agree to complete, verifiable, and irreversible denuclearization (CVID). Chad O’Carroll, Colin Zwirko, Dagyum Ji, and Oliver Hotham contributed reporting.